There are many crib mattresses out there, but some are more effective than others. In this article, we’ll review some of the best crib mattresses on the market. We’ll also give you tips to help you select a crib mattress for your child. What Should I Look For In A Crib Mattress? What Should I Avoid In A Crib Mattress? What Sleep Habits Should My Baby Maintain? This crib mattress is made of Certi-PUR certified support foam that supports the child’s body while still feeling soft and comfy. Unlike many other brands, the support foam is completely free of toxins and is designed to be completely hypoallergenic and resistant to allergens and bacteria. The foam blend allows air to flow through the mattress and keeps your baby cool as they sleep. It is 5.5 inches thick with tons of support, and it reduces unnecessary movement as you sleep, making it easier for your baby to sleep restfully. The mattress comes with a chic polka dot mattress cover that is gender neutral. When the mattress first arrives, it will come in a compact box. You will need to let it expand to its full size and air out before using it. It’s also important to note that this mattress itself is not completely waterproof, so you may want to add a waterproof mattress cover. This mattress is made of extremely high quality memory foam that is certified for safety. It’s very supportive and keeps your child comfortable and cool at night. When the mattress first arrives, you will need to give it time to inflate before using it. The mattress is not completely waterproof, so you’ll need to use a good waterproof cover. This mattress is made of supportive foam with Certi-PUR certification. It contains no PVC, phthalates, lead, or other toxic materials. It has a nylon core that is waterproof and adds stretch and give to the mattress. This mattress is dual sided - it has an extra firm side for babies and a softer side for toddlers to keep your child comfortable and supported as they grow up and get bigger. The dual sided construction helps you get more use out of the mattress, and it also makes it more durable. The side stitched seams prevent ripping and tearing, and the mattress is also designed to be waterproof and hypoallergenic. It is easy to clean with a damp cloth or sponge in the event of any staining. The two sides ensure you can use the mattress from your child’s birth all the way until they’re ready for a bed of their own. The foam is extremely high quality, with no toxins or harmful chemicals. It is very supportive for the child’s body without being bouncy. This mattress is very durable and easy to clean. Some children find the mattress almost too hard and find it difficult to get comfortable. This mattress is made with a foam core that is constructed from soybeans. One of the biggest criticisms of foam mattresses is that they are potentially harmful to the environment, but this mattress addresses that problem by using a renewable, non-toxic resource to create this foam. It is Certi-Pur certified and is made without using any harmful chemicals or other toxins. This mattress is very firm, so it keeps your baby safe and supported while they sleep. It has been safety tested and will fit in most standard cribs with no gaps. It is very durable, and has a waterproof surface and durable binding that prevents liquids from getting into the mattress. The cover is also resistant to dust and other allergens, so it helps keep your baby healthy. The mattress surface is very easy to clean with a damp cloth or sponge. It is also very light when compared to other mattresses, which makes it easy to clean and change sheets. The only downside is that you may experience some sagging after extensive use of this mattress. This mattress uses a safe and environmentally friendly soybean foam. It is very firm and completely safe for infant use. The highly durable waterproof surface is easy to clean. It is much lighter than other crib mattresses. After a few years of wear, you may experience some sagging. This crib mattress is made of flexible polyurethane foam that has been certified by Certi-PUR. While it has enough give to be comfortable while your child is sleeping, it is firm enough to support their neck and head and prevent issues like SIDS. It also will prevent them from jumping on the bed as they grow into toddlers. It comes with a removable washable mattress cover that is waterproof, and the mattress itself is antimicrobial as well as being dust and mite proof. The mattress is quite durable and will keep your baby healthy and safe for years to come. The memory foam helps prevent tossing and turning throughout the night, and it does not make any noise, so it will help your baby sleep soundly at night. Like many other foam mattresses, this mattress comes vaccuum sealed, so you will need to give it up to three days to unfold. During this time, you may notice some off-gassing in the form of odor, but this will dissipate quickly. This mattress is extremely comfortable - it feels quite similar to the touch to adult memory foam mattresses, but it just a bit firmer for safety. 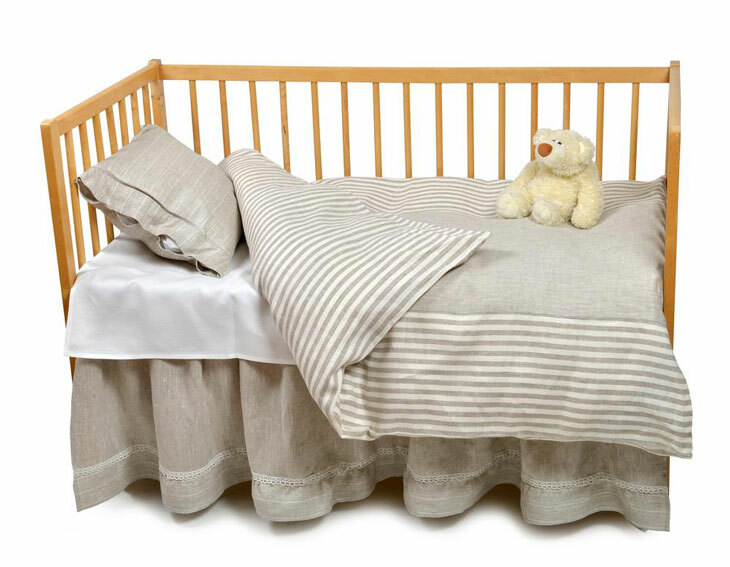 It fits snugly in virtually any standard-sized cribs. It has a very comfortable texture that is ideal for sleep. The memory foam prevents noise as the baby moves. The mattress and cover are easy to clean, and they are antimicrobial and dust-proof. You may notice some odor when you first receive the mattress, but this will dissipate over time. If you are looking for a good innerspring mattress for your child, this is a high quality option. This durable mattress has 120 spring coils that are insulated with Certi-PUR certified foams. It is double sided, with one side that is much firmer than the other. This helps you keep your child sleeping comfortably and safely as they grow up. The sides and seams are reinforced for durability, so this mattress will last a long time. It has none of the odor associated with foam mattresses, and the exterior of the mattress is durable and easy to clean. If you are planning on having multiple children, this mattress is a great one to invest in as it will last for years to come. Two sides allow you to adjust as your child grows up. Spring coils are firm yet supported, and the foam covering makes the mattress comfortable. It is very durable and will remain in good shape for years. It may be noisy when compared with foam mattresses. The first thing you should check when shopping for a crib mattress is the size of your crib. The mattress will need to fit the crib very snugly, with no room on the sides for movement. If there is room on the sides of the crib mattress, this opens up the possibility for your baby to injure themselves. Measure the dimensions of your crib carefully before purchasing any crib mattress. You’ll also want the mattress to be firm and supportive, yet comfortable enough for your baby to sleep soundly. A firm mattress is best for your child because it supports their body as they are growing, and it also reduces the chances of SIDS or suffocation as your baby sleeps. If your mattress is too soft, your baby’s head could sink as they sleep, which is extremely unhealthy and even dangerous. However, the mattress should still feel comfortable to the touch. Like adult mattresses, most crib mattresses are made using foam or springs. Both are effective, but you’ll want to make sure you purchase the best quality to prevent damage and wear as your child gets older. The mattress should be constructed in a way that allows your baby to move easily and promotes airflow throughout the night. It’s also important to have an antimicrobial cover that is resistant to staining. You’ll want your mattress to last for several years to come, particularly if your family is planning on having multiple children. As previously mentioned, you’ll want to avoid any mattresses that are too loose in your crib, as well as a mattress that is too soft for your baby. It’s also important to avoid mattresses that have thin covers that could be easily damaged, torn, or scratched. This mattress will experience a ton of wear and tear as your baby gets older, and if it’s too flimsy, it won’t last for very long. If you go for a spring mattress, you’ll want to avoid a mattress that’s too bouncy or creates uncomfortable pressure points for your baby. The springs should be appropriately cushioned to distribute pressure evenly and to prevent noise or bounciness as your baby moves along them. If you opt for a foam mattress, you’ll want to check and make sure the foam is certified by Certi-PUR or a similar organization. These checks verify that the mattress does not have any harmful chemicals and that it was produced in the most environmentally friendly way possible. You’ll also want to avoid crib mattresses that are known for excessive off-gassing, which is when the foam releases gas and odor as it is used. Some foam mattresses do have an odor when first unpackaged, but this should dissipate within a few days as you air it out. Babies and young children need a lot of sleep, so you’ll be using your crib mattress a lot as your child grows. Newborns will need tons of sleep each day in two to four hour periods, and they will likely need some help falling asleep, because they are so young. After three months or so, they will start to sleep slightly less and develop a more regular sleep schedule. They’ll also need less help falling asleep. Your baby will start to sleep through the night entirely by six to nine months. As babies continue to get older, they’ll need fewer naps less sleep in general. Consult your pediatrician to put together the best possible sleep routine for your child. While all of these mattresses are top quality for your infant, we recommend the Moonlight Slumber Little Dreamer because of the dual sides and comfortable foam. We hope you enjoyed this article and found it helpful! If you did, please don’t forget to share it with your friends.